FAKE NEWS Silverleaf whiteflies can make a tomato plant give off deceptive smells that trick neighboring plants into becoming easier targets for the insects’ attack. Don’t blame the tomato. Tiny pests called silverleaf whiteflies can make a tomato plant spread deceptive scents that leave its neighbors vulnerable to attach. Sap-sucking Bemisia tabaci, an invasive menace to a wide range of crops, are definitely insects. Yet when they attack a tomato plant, prompting a silent shriek of scents, the plant starts smelling as if bacteria or fungi have struck instead. Those phony odors prime neighboring tomato plants for an attack, but not from an insect, an international research team found. Those plants prepare to mount a fast and strong resistance against an incoming pathogen. But that high alert suppresses the plants’ chemistry for resisting insects and “leaves them far more vulnerable to the whiteflies when they arrive,” says Xiao-Ping Yu, an entomologist at China Jiliang University in Hangzhou. Tomato plants that spent 24 hours in a chamber with just the odor of a major whitefly attack managed to produce only half the surge of an insect-fighter hormone as plants taken by surprise by an insect attack, Yu and colleagues report March 25 in the Proceedings of the National Academy of Sciences. Plant defense chemistry often poses this one-or-the-other dilemma. To put up a good fight against insects, plants typically rev up a system of defenses controlled by the hormone jasmonic acid, or JA. But throwing that system into full gear suppresses the defenses controlled by salicylic acid, SA, which are more useful against pathogens. The pathogen prep may not be a complete waste of effort for the plants. Whiteflies function like mosquitoes for plants, spreading viruses and other diseases. Even drops of whitefly pee, sometimes called honeydew, attract sooty mold. “Maybe the plant is more worried about diseases,” says study coauthor Ted Turlings, a chemical ecologist at the University of Neuchâtel in Switzerland. In the short term, the deceptive signal costs the neighbor plants because whitefly infestations get off to a strong start. But the diseases whiteflies bring may mean the SA defenses could be useful in the end. “We will try to explore this in follow-up research,” he says. To help cultivated tomato plants defend against whiteflies, Petra Bleeker of the University of Amsterdam is turning to a wild relative, Solanum habrochaites. It makes its own insect repellants, compounds called terpenes, in glands at the tips of abundant hairs. Commercial tomatoes still show vestiges of this hairy chemistry. “If you put your finger on these hairs, on the green parts, you smell the typical tomato smell,” she says. The trick will be breeding the power to make repellants back into domestic plants without introducing unwanted traits. Turlings is taking a different approach to helping beleaguered tomatoes. Because the odors that waft off plants can be highly specific to what has attacked them, machines with sensitive “noses” could raise an alarm when particularly problematic insects or pathogens arrive. “It sounds futuristic, but a robot might sniff the plants,” Turlings says. Even his human (but very experienced) nose can smell the difference between scents released by two corn plants under attack by a different, but related, caterpillar species, he says. Monitoring for those scents might warn a farmer in time to squelch pest invasions early. 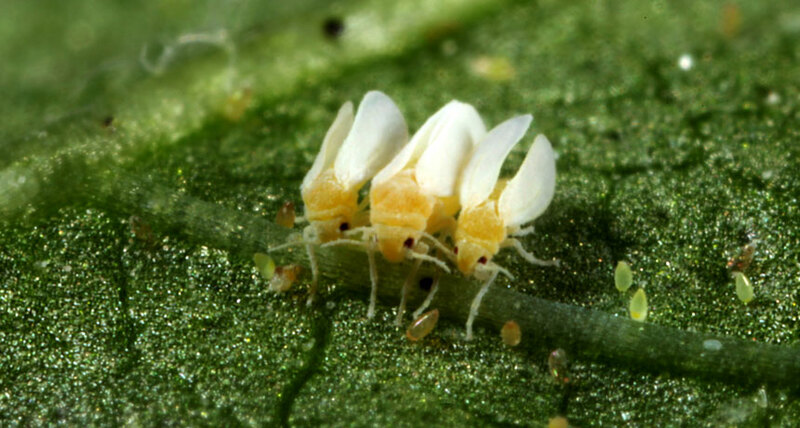 Quick action could be particularly important for pests like whiteflies that accelerate their own spread through false signals to eavesdroppers.